Note: The following is part of our roundup of USB-C battery packs. Go there for details on how we tested this device. 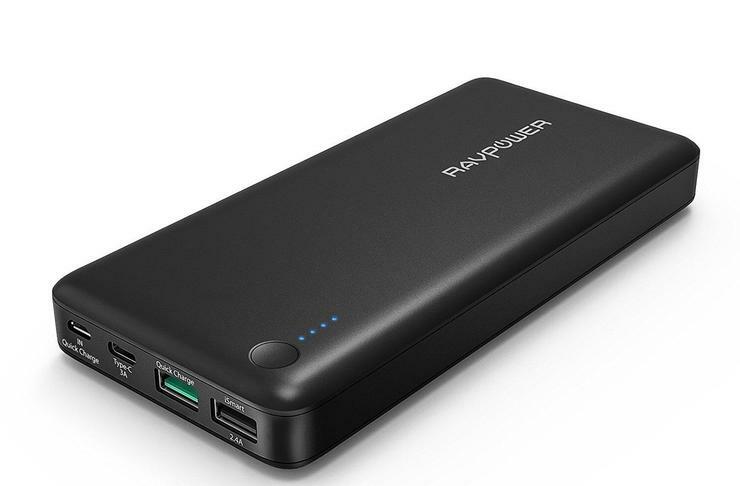 Priced at just under $50, the RAVPower 20100 battery pack isn’t a bad deal. It has Quick Charge (QC) 3.0 tech inside, and a lone USB-C port can charge a phone or MacBook, or accept a charge itself. There’s nothing fancy about the design of this particular RAVPower pack. In fact, if you’ve seen nearly any other RAVPower battery pack, you already know what this one looks like. It’s a black brick, with four ports on the front: microUSB, USB-C, USB-A with iSmart technology, and USB-A with QC 3.0. A power button and four blue indicator lights are found on the top of the pack. With a total capacity of 20,100 mAh, or 74.3 Wh, there’s enough juice in the pack to charge your phone a few times over. Unfortunately, our testing reveled that the pack isn’t as efficient as the RAVPower 26800 we reviewed last year. The 20100 came in at 72.79 percent efficiency, putting it slightly above the last-place Lumsing (72.71 percent). It’s not a deal breaker, but the 20100 performs below the average efficiency of 76.23 percent for the batteries we’ve tested thus far. Recharge time depends on what you use to charge the pack. Standard microUSB wall adapter and cable will lead to longer charge times—8.5 hours approximately—while using USB-C and a wall adapter capable with Quick Charge built in is supposed to cut that time in half. Although, I couldn’t get the pack to charge at a faster rate than 5V/2A. Included in the box is a cloth carrying case, two microUSB cables, and a microUSB-to-USB-C adapter. Notice, a wall adapter is not included with this pack, as it previously was.